In hands-on testing, Principled Technologies (PT) found that the Lenovo ThinkSmart Hub 500 enabled testers to complete common meeting tasks like creating meetings in up to 89% less time compared to two traditional conferencing platforms, Citrix GoToMeeting and Cisco WebEx. Annually, the time saved on creating meetings could be worth up to $193 per employee, helping companies improve their productivity while employees focus on strategic tasks that improve the bottom line. Durham, NC, February 16, 2018 --(PR.com)-- Conferencing technology can have a huge impact on how smoothly meetings go - and how much, or how little, employee time gets wasted in the process. In hands-on jury testing, PT asked volunteers to complete three common meeting scenarios on the Lenovo ThinkSmart Hub 500 as well as two traditional conferencing platforms. 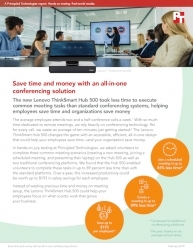 With the Hub 500, testers created meetings in up to 89% less time, joined a meeting in up to 84% less time, and presented a laptop in up to 24% less time than they could with traditional platforms.